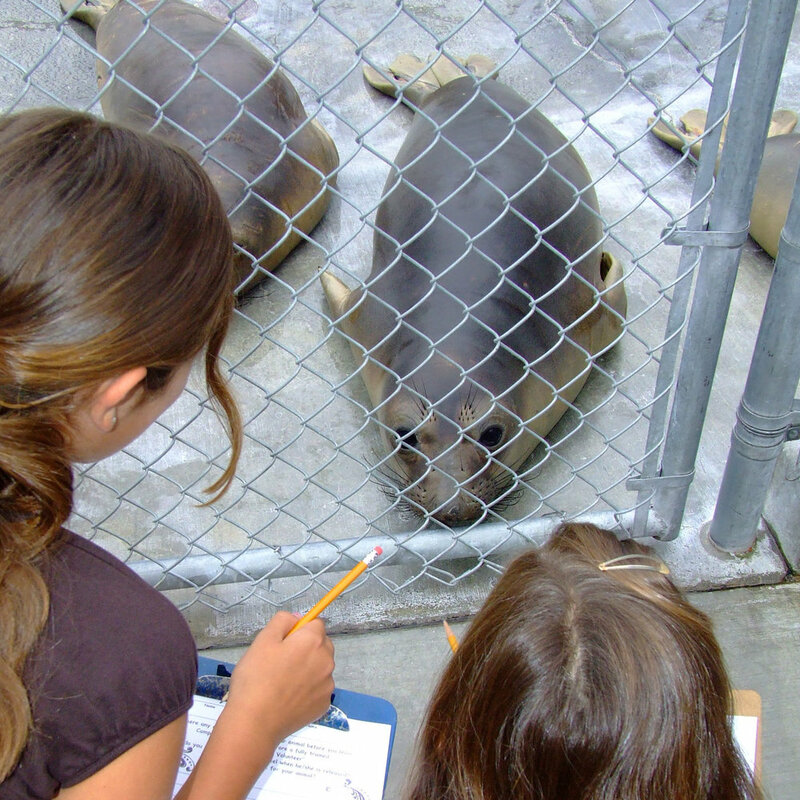 Our facility offers a unique experience for children to witness a marine mammal hospital in action. Sign up today! Entangled and malnourished sea lion with fishing hooks in mouth and flipper. Malnourished elephant seal rescued from Thousand Steps Beach. Elephant seal pup rescued from Shaw’s Cove, Laguna Beach with multiple rat fish barbs in neck. Sea lion with injury to right eye rescued from Newport Beach. Someone is a little lost, this malnourished sea lion was picked up from someones porch in Surfside. Dehydrated and malnourished sea lion rescued from Newport Beach. Malnourished elephant seal rescued from Laguna Beach. Malnourished elephant seal rescued from main Laguna Beach. Severly entangled sea lion rescued from Bolsa Chica State Beach. Harbor seal rescued from Monarch Beach with a swollen muzzle. Elephant seal pup rescued from Newport Beach. Malnourished sea lion rescued from Huntington Harbor docks. 76 pound malnourished elephant seal from Strands Beach. Sea lion rescued from San Onofre with a fishing hook in lower lip. Malnourished harbor seal found at Shaws Cove. Malnourished sea lion found with rubber band around it’s muzzle. Malnourished sea lion found under Newport Beach Pier. Malnourished sea lion with superficial wounds rescued from Dnan Point Harbor. Malnourished Harbor Seal pup rescued from Newport Beach with facial wounds. Malnourished elephant seal pup from San Onofre weighing only 70.3 pounds. PMMC’s first Harbor Seal rescue of 2019. This little one came from Calafia State Beach. Rescued from Crystal Cove malnourished and dehydrated. Hidden is the shrub, this little one was rescued from Califia State Beach. Weighing only 74 pounds rescued from Crystal Cove. Malnourished elephant seal brought to us from Crystal Cove. Malnourished Northern Elephant seal rescued from Newport Beach. This little one was picked up from Newport Beach, malnourished and dehydrated. 63 pound emaciated Northern Elephant seal, smallest this year! Malnourished sea lion pup found in the back bay of Huntington Harbor. Sea lion pup rescued from Huntington Beach malnourished with severe swelling to face. Sea lion pup rescued from Huntington Beach, malnourished and dehydrated. Malnourished Northern elephant seal rescued from Corona Del Mar. Underweight Northern elephant seal pup rescued from Corona Del Mar. Emaciated sea lion pup from Huntington Beach only 24 pounds. Malnourished sea lion pup from Newport Beach. Malnourished sea lion pup rescued from dog beach, Huntington Beach. This little one was rescued from The Wedge hypothermic, malnourished and very dehydrated. Two malnourished sea lions rescued from Newport Beach & Dana Point, staying warm in the ICU. Sea lion pup with fishing hook embedded in eye. Malnourished sea lion pup from Sunset Beach. Malnourished and hypothermic sea lion pup rescued from Laguna Beach. Malnourished pup rescued from Sunset Beach. Sea lion pup rescued from Newport Beach malnourished with a swollen muzzle. Malnourished pup rescued from Newport Beach being greeted by Floki & Meatball. 21 pound, malnourished sea lion pup rescued from Newport Beach. A malnourished sea lion pup rescued off the cliffs of Monarch Beach. A 25 pound sea lion pup rescued from Newport Harbor. (From left to right) Meatball came in at only 24 pounds and a puncture wound on her neck. A malnourished pup, found in Huntington Beach with a large fishing hook in her lower right jaw. He was rescued from deep in the rocks at Strands Beach in Dana Point, Malnourished with a left eye laceration. PMMC restranded animal, rescued in Dana Point dehydrated, lethargic, slightly blind & had lost a significant amount of weight since first release. PMMC restranded animal, rescued in Newport dehydrated & underweight. Re-strand from PMMC, lost 24 pounds after being released on 1/27/19. We have 67 animals we are currently caring for. Most patients are visible from the visitor yard, however, some patients may be in critical condition and recovering in our intensive care areas. Check out more of our pools as the patients enjoy the Laguna Beach sunshine at different stages of recovery. Calling all future marine biologists and ocean stewards! Learn about the role we serve in keeping our oceans clean with our Daisy, Brownie, Junior & Cadette programs. Conservation-minded children can choose to support PMMC's mission and animal care needs. Our educational programs are a key component to increasing awareness of the issues facing marine mammals and the environment in which they live, and developing a sense of stewardship for those resources. At Pacific Marine Mammal Center, we love our volunteers! We utilize volunteers to help us with our animal care, docent & education, and gift shop needs. Your support provides a second chance at life for our marine mammal patients. Each gift makes our life-saving work possible! Get all your PMMC gear at our online Treasure Trove gift shop. All the profits go to the care of our patients. Our patients are sentinel species of our environment. Their intricate involvement on both the terrestrial and marine environments provides us with a unique wealth of knowledge.